This link traps malicious email address harvesters. Humans, do not follow; do not click this link. Click anywhere else on this page! This is the home page of our static subdomain. Please use search, the navigation menus, or links at page bottom to find browseable content on the main Baxter & Cicero website. Open weekdays from 8AM to 4PM. We work with sailors, electric and power boaters, businesses, clubs, homeowners and boat builders. We build and repair sails. We make production or custom yacht, sail, and boat canvas, awnings, bimini tops, board bags, covers, dodgers, equipment covers, enclosures, patio furniture covers and other canvas products. We sell Baxter & Cicero-branded soft luggage, gear and duffle bags. We do custom embroidery and upholstery work. We are contract fabricators. We sell monogrammed sportswear for yacht crews and businesses and fabricate corporate awards, customer appreciation gifts. What can we make for you? 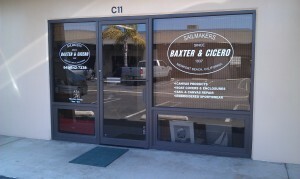 We have served sailors, boaters, and business for many years. Learn more about us.